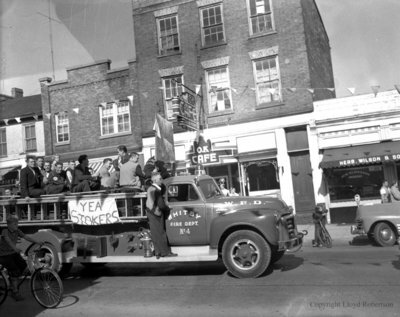 A black and white negative showing the Whitby Stokers baseball team riding in the back of a fire truck during their victory parade. In this view they are passing the O.K. Cafe located at 116 Dundas Street West. This negative has started to deteriorate. Whitby Stokers Baseball Team Victory Parade, October 10, 1955, Lloyd Robertson. Whitby Archives A2014_002_010.